Quote: ‘I don’t like casinos. I don’t like how they ruin people’s lives. I don’t think the employment they provide is a worthwhile thing for those people. They’re taking people that could be contributing to society and making them do a job that has no redeeming social value’. Thanks to his success and strong organization skills which help him to hold the whole blackjack team together for so many years already, Tom Hyland was honored to be one of the top 7 initial members of the Blackjack Hall of Fame in 2003. But not everything was so fine and positive all the time: because of his popularity and great sums of money won, Tommy was often banned from casinos, arrested, and even threatened to be killed by one of casinos owners where he won a lot of money… Tom Hyland always had “battles” and “wars” with casinos in courts, trying to prove his and all players’ right to play, to use this or that techniques etc. What do we know about Hyland-Casinos wars? Once, the owner of the casino, where Tommy Hyland played and won a big sum of money, forced him with the help of gun to give the whole his winning back when discovered Tommy to be a card counter. Once, Hyland was caught at the casino of the Bahamas where he used a computer device to play blackjack, though computers were not prohibited to use then. Tommy was put to a jail and spent there 2 days after what he was proposed to admit his guilt and pay a fine of $100 000 or spend a half a year in a jail till the time the court would consider his case. Certainly, Hyland preferred paying to sitting in a jail though he did not consider himself to be guilty anyhow. 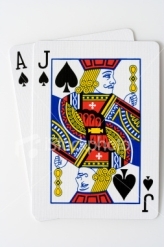 1994 has become known as the year of Hyland’s blackjack team arrest: some of its members were arrested at Windsor casino (Ontario, Canada) for using key-carding that was accepted as a way of blackjack cheating. Anyway, the judge did not count this technique to be cheating but clever usage of mathematics and blackjack strategy; Arnold Snyder took part in this case as an expert to discover whether key-carding was a cheating then. All these difficulties did not make Tommy Hyland to give up blackjack and refuse from everything what he did. Quite the contrary, he takes part in different legal “battles” and “wars” with casinos to protect the rights of professional blackjack players. All gamblers consider Hyland to be a real gentleman, a loyal personality who knows what he does and who is always ready to struggle for justice.